NEW. AND IMPROVED.ZOOM H4N PRORecord cleaner, clearer, and closer than ever before. At Zoom we’re always developing new ideas to improve the performance and function of our Handy Recorders. With the new H4n Pro, we've taken everything creators love about the H4n and brought it to the next level. * +4dBu line-level is not supported. The H4n Pro provides the essential combination of mic’ing versatility, portability, and superior audio necessary for impactful storytelling. With support for plug-in power, you can use a lavalier to mic up your subject for podcasts or interviews. Record time-stamped WAV files to sync with video footage in post-production, or embed superior audio directly on your video in real-time through a ⅛" stereo feed. The two locking combo connectors accept either XLR or ¼" balanced/unbalanced phone cables, handling mic- and line-level signals as well as instrument-level signals. Phantom Power of +24 or +48 volts can be applied to both inputs. Plus, there’s a stereo 1/8” Mic jack for external audio sources, including lavalier microphones requiring 2.5 volts of plug-in power. A stereo ⅛" Line/Phone Out, with dedicated volume control, allows for headphone monitoring or connection to your DSLR, while the built-in monophonic speaker allows for quick playback reference. In addition, a USB port enables fast file transfer, firmware updates, and use as a 2-in/2-out audio interface for computers. A new rubberized, ergonomic body is perfect for use in the field or with a camera, while new locking XLR/TRS connectors ensure your mic cables stay secure. Highly portable, the H4n Pro can travel anywhere for convenient mobile recording. STEREO MODE uses the built-in X/Y microphones (or external mics) and is convenient for recording live performances, acoustic instruments, dialogue, and more. In 4CH MODE, you can record with the built-in X/Y mics and two external inputs simultaneously, great for getting live room sound and a stereo board feed at the same time. MTR MODE (Multi-track Mode) turns your device into a four-track studio, with built-in effects, overdub functions, and the ability to work with previously recorded sound files. Pre-Record ensures that you'll never miss the start of a great take. The device is continuously listening, keeping the previous two seconds* of audio whenever you hit RECORD. *One second when recording at 96k or working 4CH mode. Auto-Record automatically starts recording when a user-set sound level is detected. There's also an Auto-Record Stop function, which ends the recording as soon as the incoming signal drops below the user-set stop level. The Pro offers studio-grade effects and emulators to enhance your recordings. Choose from a variety of effects, including compression, limiting, reverb, delay, echo, a low-cut filter, and more. There's an onboard metronome and tuner, along with dozens of amp models and effects crafted for guitar and bass. 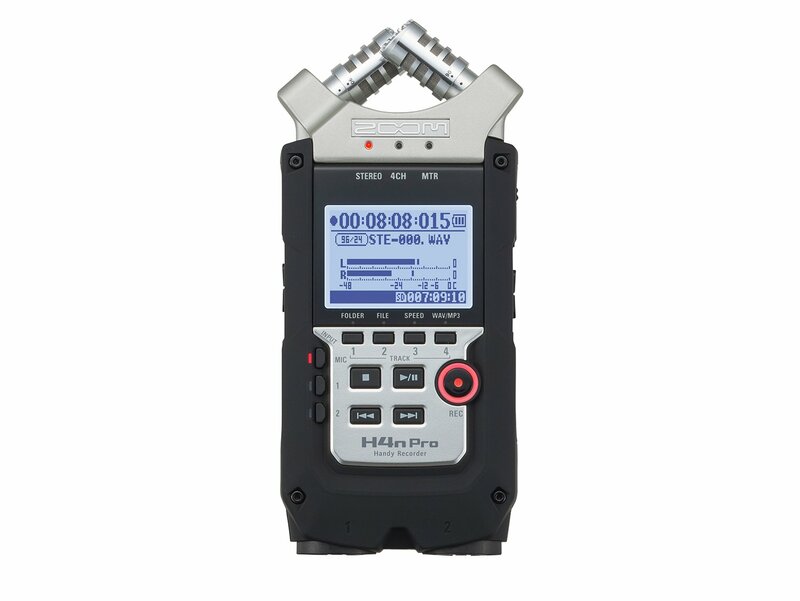 Additionally, you can loop playback and adjust pitch and speed independently, making the H4n Pro a perfect tool for phrase training. The Pro records audio in both WAV and MP3 formats. It supports 16- and 24-bit WAV audio at sampling rates of 44.1, 48, or 96 kHz. The WAV files are automatically time-stamped, making them Broadcast Wave Format (BWF) compliant, allowing precise synchronization in post-production. The H4n Pro runs on 2 AA batteries, providing up to 6 hours in normal operation, or up to 10 hours when operating in STAMINA mode. An optional AD-14 AC adapter allows the H4n Pro to be powered from any standard wall outlet. The H4n Pro accepts SD and SDHC cards up to 32 gigabytes. The charts below show maximum recording times for different file types and card sizes. The H4n Pro comes with free download licenses for Steinberg’s Cubase LE music production software and WaveLab LE audio editing software, representing a complete audio production toolkit. Create your own music utilizing the Pro’s USB audio interface function or expand your capabilities with Steinberg’s renowned audio software.